I’ve really been enjoying baking over the last few weeks, with local flour and eggs. Today's bake was based on Whole Wheat Pitas, from Mr. Reinhart's book Whole Grain Breads. Recalling the delicious barley flour pita sampled at Kneading Conference West (thanks to Andrew Ross and Leslie Mackie), I substituted 50% Red Fife wheat flour (75% sifted) and 50% Fairhaven whole grain barley flour, to try to replicate. I was delighted! to receive the Fairhaven whole grain barley flour as a gift and to have the chance to try it out in these pitas (with many, many thanks to the one that kindly gifted this barley flour to me!). The flavor and texture of these pitas are just what I hoped for. I got my firebrick baking stone up to 550F to bake these! 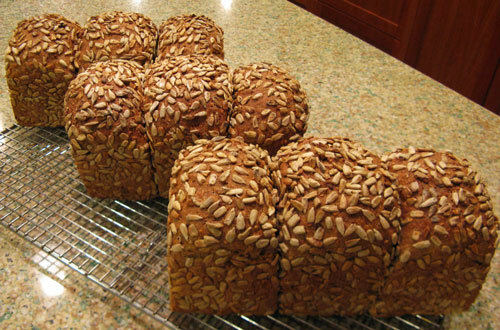 Yesterday's bake was German-Style Many Seed Bread, also from Mr. Reinhart's book Whole Grain Breads. After Khalid posted about his beautiful version of this bread, I was inspired to make some. We all loved it here, and I was happy to make more this weekend. Both bakes were made with 100% whole wheat flour grown by my local wheat farmer (there's a bit of whole rye in there too). I caught Andy's post yesterday and wanted to try shaping my pan loaves like his lovely sunflower-coated loaf! 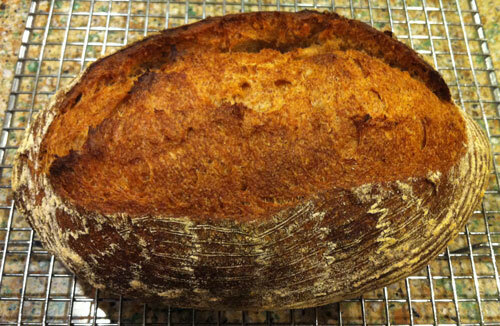 This bake was inspired by MC's posts, Winthrop Whole Wheat Loaf and Meet the Baker: Scott Mangold. I was so happy to see these posts, having the pleasure of meeting Mr. Mangold and visiting BreadFarm bakery last September. What a lovely bakery - incredibly beautiful loaves and cookies. For this wheat loaf, I substituted 75% sifted Red Fife for the soaker and final dough, and my local farmer's farm-milled 100% whole wheat in the levain. I loved the acidity and flavor from the whole wheat levain in the wheat loaf, and the bloom this loaf got in the oven! My local wheat farmer raises the most beautiful chickens, and has been giving me lots of perfect eggs…I used some to make chiffon cake and a flourless, butterless (almost unheard of in my kitchen!) cake of Nigella Lawson's. 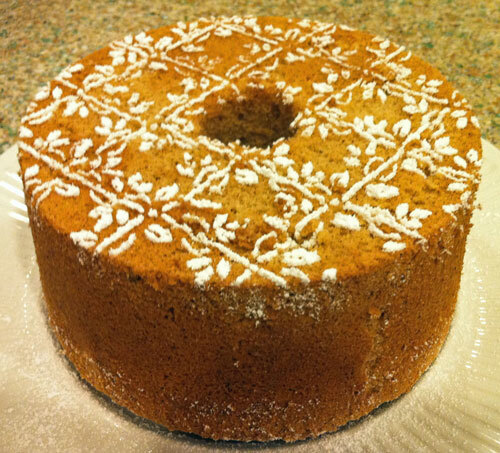 The chiffon cake, a 'chai chiffon', is based on this recipe from Fine Cooking magazine. I whipped the eggs and sugar in the mixer until it was good and thick, then folded in the pureed mandarin, almond meal and baking powder (and a bit of salt, ¼ tsp). I baked the batter in three pans (two small tube pans and a small round cake pan). I thought the tube pans were better choices for a good thorough bake for this batter. 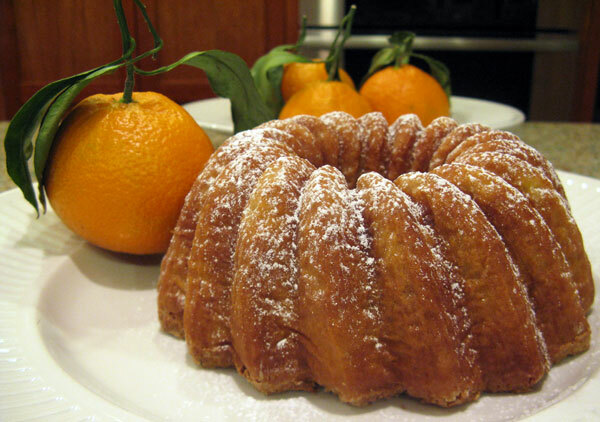 This cake wasn't one of my husband's favorites, but I liked it and enjoyed chance to try something different (a cake with no flour and no butter!). .... I could go on and on and on. Lovely to see a post from you Breadsong. I'd made a lentil-rice salad from the (wonderful!) book, Mexican Everyday by Rick Bayless, and had cooked some extra lentils and rice. 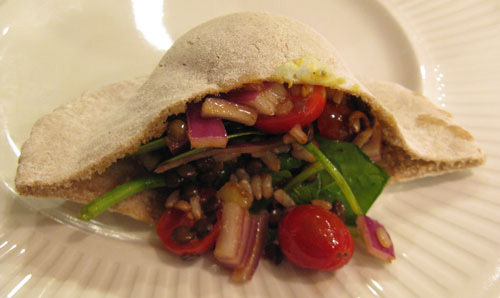 The extra lentils and rice made it into this pita filling along with spinach, red onion and tomato (saw the cherry tomatoes at the store; was still thinking about those tomatoes growing on your family's farm!). The salad dressing, a chipotle-balsamic vinaigrette, dressed the pita filling as well (this dressing is yummy!). Breadsong, those are exquisite looking bakes! I love barley flour, yours look very appetizing. your many seed bread looks beautiful. Iam going to try this shaping technique next. I really liked using this wonderful Fairhaven Mill barley flour. I am looking forward to baking a loaf with it. 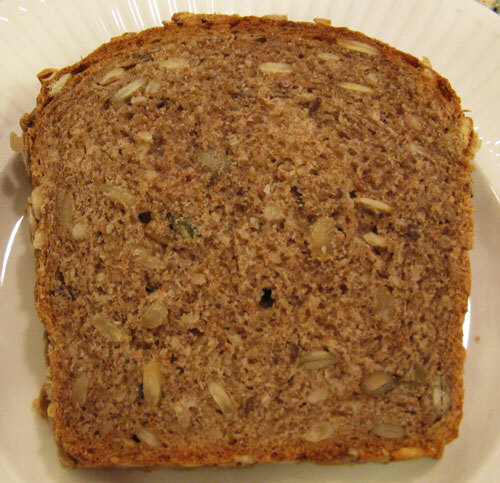 The many-seed bread is an absolute favorite - I'm so glad I saw your lovely post - and Andy's too, for the shaping. Mr. Reinhart's book has been here on the shelf waiting for me, for too long! Every time I try making one of his breads, the bread is so delicious and I wonder why I waited so long to try it. Thank you so much for your compliments on the baking! everything here is so wonderful to feast the eyes on; wonderful baking. Regarding the shaping method, I adopted the same style used to make all the woeful "Sandwich" wrapped bread made in our large UK bread factories. 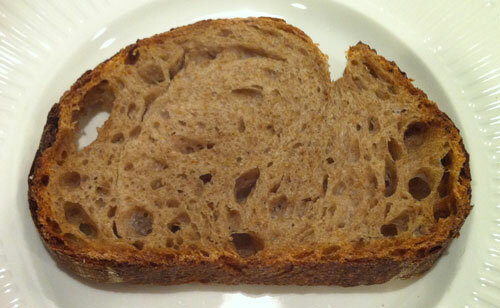 Look at the Pullman Pan loaf, as this the true style, known as "four-piecing". The theory is that because each of the four pieces is turned through 90 degrees on how a single piece sits in the tin, then the gas bubbles in the dough will be squashed face-on, rather than side-on in the moulding and shaping action. This is important to the white-obsessed plant bakers, as it means the light is reflected onto the crumb more effectively, making a white loaf seem extra white!!! I like to use it because I think my canny customers will then be able to freeze the bread in portions if they want to! So shall we call this method "three-piecing"? I have a large pullman pan but have rarely used it, as it makes, for our household, a really big loaf. I like the idea of "four piecing" as a means to easily/neatly freeze portions, if making one of these big pullman loaves, though. Thank you so much for your compliments, Andy; it means a lot to me! Thank you so much! 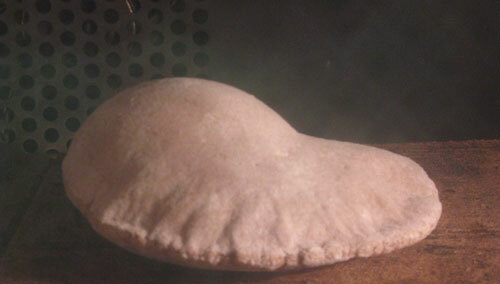 The pita was very tasty with the lentil filling, and dressing. I just love that cookbook by Mr. Bayless. Such flavors! Now that's whole grain goodness for every occasion, breadsong, and they all look fantastic! Thanks so much for sharing it all. Hello Marcus, and thank you so much! My local farmer's flour has been so wonderful to bake with, both the hard and soft wheat varieties. I am very, very happy with how the soft wheat flour is performing in quickbreads and cakes, and the hard wheat flour for breads. And now the luxury of this whole grain barley flour, and the very special 75% Red Fife too! I am blessed to have such good flours nearby. skill Birdsong. You need a bakery of your own!!! Not that I would wish those hours on anyone :-) Your breads and cakes are top notch. I froze some hummus the other day and I haven't made Pitas ....... in forever a long time. You have inspired me to do so soon. This bucket list is getting huge !!! This is a very kind comment - thank you! 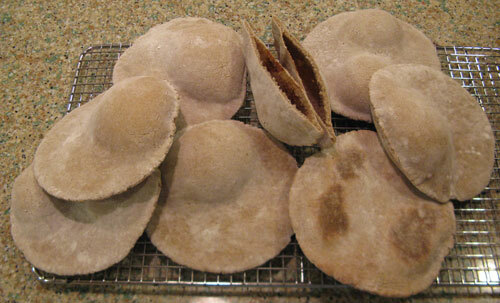 The pitas are very tasty with the barley flour - I hope you get a chance to make some. Good luck with your list. 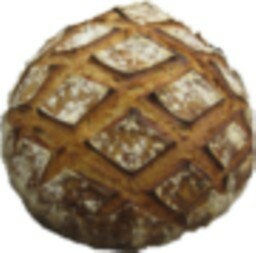 I wish I could be a full-time baker...to have more time to try the many wonderful-looking breads on my list (the list that grows by the day, as a result of so much beautiful baking shared on this site; it's wonderful to get so much inspiration from the many, many talented bakers here!). Thanks for your contributions the rest of us marvel at - I do have barley berries hanging around sonewhere too!! Thanks again for another kind, enthusiastic comment - and hope you have fun with the barley! I don't know where I want to start, in expressing my thanks to you! Your gift of the barley and rye flours was so thoughtful - and didn't the barley flour bake up into the most delicious pitas. So looking forward to future bakes and wonderful flavors, with these special flours! Your lovely posts, for the Winthrop Wheat Loaf, and other baking with less butter, were so motivating - I am very grateful. I am glad you are not that far away. It would be such an honor to bake a loaf for you sometime!